The long awaited new Mazda MX-5 RF. The long-awaited Mazda MX-5 retractable fastback is set to officially launch in Ireland. 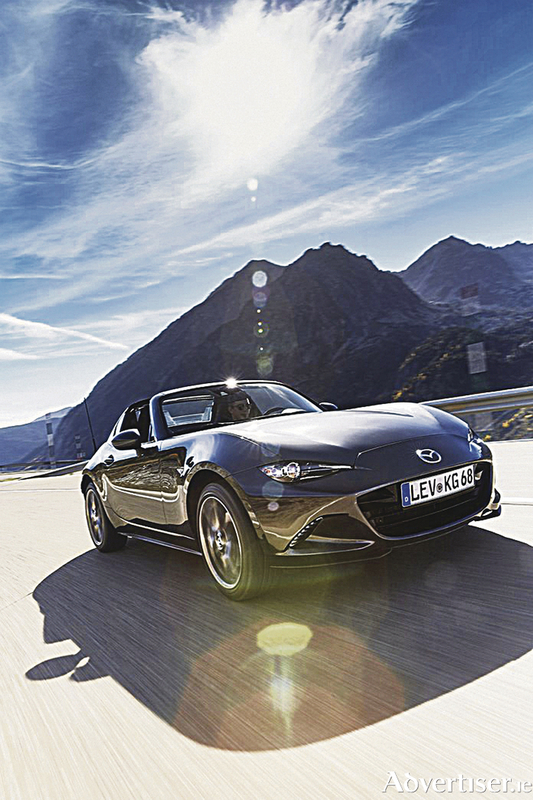 There will be two engines available in the MX-5 RF line up. A 2.0-litre SkyActiv-G engine with 160ps will join the 131ps 1.5-litre engine which is already available in the MX-5 Roadster. The more powerful engine will be available in the GT grade and will feature a limited slip differential and 17-inch wheels as well as Bilstein dampers and strut brace to further enhance the dynamic set up. There will be two grade levels with the Mazda MX-5 RF. Across the range the MX-5 RF features alloy wheels, LED headlights, MZD Connect, cruise control plus automatic air conditioning. Mazda MX-5 RF GT models with the 1.5-litre engine are distinguished by 16-inch gunmetal alloy wheels and piano black wing mirrors, while the 2.0-litre GT is differentiated by 17-inch bright alloys wheels and body coloured wing mirrors. Both engines in the higher spec also feature rain sensing wipers, rear parking sensors, smart keyless entry, 9 premium Bose® surround-sound, and heated leather seats. The MX-5 RF fully embodies the "Jinba-Ittai" philosophy of the driver and car in harmony that has defined the MX-5 throughout its 27-year history. This latest adaptation of Mazda's lightweight two-seater features an eye-catching fastback design with a three-piece power retractable roof, that when opened leaves the rear buttressed section in place for a unique convertible atmosphere. The MX-5 RF joins the fourth generation MX-5 Roadster which was launched last year and has since won numerous awards including the 2016 World Car of the Year and 2016 World Car Design of the Year. With more masculine undertones and the availability of a sportier 2.0-litre engine the MX-5 RF aims at adding to the success of the Mazda range by appealing to a wider market and winning judges' hearts to add to the 280 plus awards the model has already won. John Perry, managing director of Mazda Ireland, says since the launch of the fourth generation MX-5 last year, Mazda has been looking forward to bringing the retractable fastback to Ireland. "The Roadster exceeded expectations and still manages to impress every time you get behind the wheel," he says. "The RF now offers customers the option of having a mechanical folding roof to guarantee additional refinement and enjoyment in the often harsh Irish conditions, while the 2.0-litre engine and limited slip differential allows even more enjoyment for those who really love their drive."